Pork loin is on sale through tomorrow 4/10 at Jewel for $.99 a pound. There is supposed to be a Hormel coupon on line to print for $2 off, and there is also supposed to be a coupon in the latest Valpak. At the Lake Forest Jewel, the manager advised they needed to alert customers to this deal. The freezer section manager had a lot in inventory and needed the space. Word of the Day: Free bag or Kcups of Papa Nicholas coffee when you say "Who is your Papa". Hi- That is something I can actually use. Only the bags though. I don't have a Krups. I don't need coffee right now, but it will keep. I just bought some Hills Brothers last week when it was $4.99. The ice cream I passed on yesterday though, and I am going to pass on the caffeinated water. I hope for people that do cash in on the water that they have fixed the glitch in mymixx. When I went on mymixx yesterday, I noticed my gas rewards were actually up. I have 20 cents worth of Rewards that I have to use up by the end of the month. I only redeem them when I am out of Cook county. I have to go to Libertyville in a week. I might check before hand and see how much gas is up there. I just bought gas four days ago at Sams Club in Evanston where I paid $2.75. Everybody should be aware that this word of the day is only good for the organic Papa Nicholas. Apparently the organic version is only available at Jewel. I would not wait until the end of the day to get it. I am not sure how much of it is going to be available tomorrow. Maybe some stores will let you pick up the regular Papa Nicholas if they run out of the organic version. It is up to each store manager as to whether they are going to allow you to substitute. I was in Jewel last night and I got my 4th coupon for a free package of gravy mix. I hope I don't win any more. The coffee is not limited to organic nor is it any type you want. I went to the cashier with organic whole bean, though it wasn't what I really wanted. When she pulled out her worksheet, I saw ther was a long list of options. I borrowed it and went back to take an approved variety. The cashier commented I practically the only one who picks up the WOD freebies. I advised I am lucky to have friends who alert me. Thank you Artie and NFriday! Rachael over at Mashupmom, went into the Villa Park Jewel at 10:30 this morning, and they had a small display of the organic coffee near the 15 item or less check outs, and she said the pile was half gone. I think it depends on which Jewel stores you go to. Yes you have to do some digging to get it, but most of the time by the time I get to the Jewel on Chicago Avenue in Evanston in the late afternoon they are out of it. I think people in Highland Park are not as much into deals, and that is why the closest Aldi's is 10 miles away. A good start to the coffee search would be looking for the 9.99 bags that are marked down to 7.99. Snagged a few. "Black And Tan" and "Kenya Sutra." Both were in the black bags. I assumed that the freebies were the cheaper 5.99 bags, grabbed a french roast and got denied at the register, but the cashier let me take a pic of the qualifying product list so I could pick one out. It appeared to be the more expensive ones in the black bags along with the brown organic labels. How often do the word of the day deals come? Is it everyday, or once a week? Is facebook the only way to see these (not on facebook)? By the time I got to Jewel last night after 9 PM, they were out of the freebie. The clerk told me to select any of the other PapaNicholas coffees. Hi- The word of the day occurs most frequently on Fridays, but not every Friday. This Friday they are supposed to have a Fisher nuts freebie, and no I do not know the word of the day. I was going to go there yesterday to get the coffee, but I just got a can of coffee that I have not opened up yet that I got for $4.99 last week, and it was not worth my while to get in my car and go to the store just for the coffee and to redeem another gravy coupon. I was also worried that they would be out of the coffee by the time I got there. There were apparently 7 different varieties of coffee you could redeem, and no the coffee in the black bags was not on the list. Not every Jewel carried all 7 kinds though. All of the 7 were organic. It is too bad you can't go on Jewel's Facebook page unless you belong to Facebook. You can always check here, and somebody will post it. I also belong to mashupmom's Facebook page, where she posts it. That is just so funny. The Kenya Sutra and Black and Tan were in the black bags. I got one of each at 2 diff stores. The friendly checkout lady told me at the start of her shift, a gentleman handed her a bag of the coffee and said, "Who's your daddy!" She said she was really taken aback because she wasn't informed of the promotion, and her and the cashier next to her almost laughed themselves into tears while telling me this because she freaked out pretty hard. NFriday wrote: Hi- The word of the day occurs most frequently on Fridays, but not every Friday. 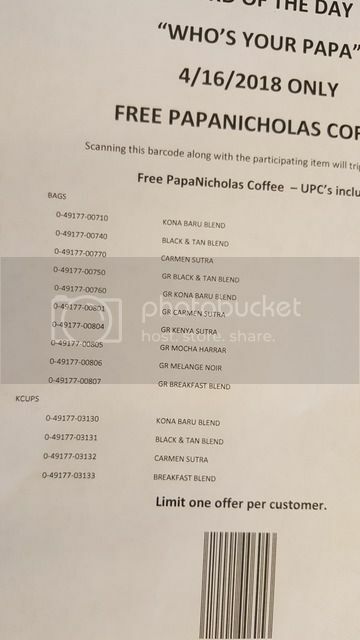 Actually the list of coffee that Barb posted over at MUM, I believe was a list that corporate sent her. She lives in Waukegan, and has several FB groups she operates, including a Jewel one, and Jewel sends her a copy of the store ad a few days early, and lets her know in advance about any promotions that are coming up. There were several people over at MUM that reported they had problems getting the coffee for free because nobody informed the cashiers that this was going on. In one case a customer noticed that the coffee rang up, and she asked if it was going to be free, and the cashier said yes, and when she and her three kids got to the car, she looked at her receipt, and found out she got charged for the coffee, and so she and her three kids had to stand in line at customer service so she could get her money back. Maybe the Jewel cashiers should start checking the Jewel FB page. The first time I got one of these things, the cashier gave me an odd look when I said the word. Now, I just say "this is the word of the day thing." I've had two cashiers thank me for doing it like that (I imagine especially with the "Who's Your Papa").... tell me they receive no word or announcement about what the item or the word is, so it's helpful to just say that. One of them told me that a few weeks ago it was some WWE thing and a woman kept saying "SMACK DOWN!" getting increasingly agitated, it took him a while to realize she wanted the free item. Also, she has the word wrong, as the promotion was "Main Event." Don't the cashiers have to scan something to get the free item to come off? I've only taken advantage of the WOD a few times. Either it is something I am not interested in, or they are out of it when I get there, or I don't need anything else, and I don't want to get in my car and drive there if they are out of the item. At least with the Saturday sampler you have three days to redeem it. In general Jewel is much less likely to run out of the Saturday sampler than they are the WOD item. If they are out of the word of the day item, some stores will let you substitute something else or give you rain checks, and some stores won't. I think it is up to each individual store manager. NFriday wrote: Don't the cashiers have to scan something to get the free item to come off? Yes. If you happen to be their first encounter, they have to run around to get the paper. I find obtaining the WOD item worthwhile. It is typically of higher value than MyMixx. I am always willing to try something new at least once. Probably the best item was the Left Field Milk, which my Dad and I debate its merits. I thought it was creamier than the whole milk from Jewel. My Dad and sister are more picky. When it was ice cream a few weeks ago, my Dad willingly went to Jewel. My sister was quite interested in the coffee. Otherwise they have never otherwise shown up. The only product I picked up I have been reluctant to try is the vegetable purees reworked to look like onion rings. WOD and MyMixx have a feature I really like: free! If you wish to give it away, I am glad to take it. Many grocery store receipts have useful coupons. At the Lake Forest Jewel, there is currently a 99 cent Dunkin Donuts medium coffee plus 49 cent donut plus Ferrentino's Pizza and Clucker's Chicken discounts available by just tearing them off. Lewis Market in Waukegan has coupons for the 'new economical' Chinese Buffet at 41 and Delaney roads plus a five dollar off coupon at Community Thrift. I have never been to this Chinese Buffet, but the name makes me laugh. It's just another wee savings, which a friend smartly advised was non-taxable income. We’ve gotten enough gravy to fill a jacuzzi. And a half gallon of organic milk that was surprisingly good. Left Field milk is not organic. I thought the milk was good, but I personally like Oberweis milk better. I would buy Oberweis all the time if it wasn't so expensive. Jewel currently has Left Field milk on sale for $1.99 and there is a $.50 coupon for it on mymixx. In regards to the gravy mix, maybe Jewel is printing so many free coupons for it, because they know that a lot of people will not redeem their coupons for it. When I asked over at mashupmom what people were doing with their gravy mix, I got some I am just donating it to the food pantry, and plus it is a free game piece item. How many food pantries can use 20 packs of gravy mix though? Maybe if people were also donating meat to go along with the gravy mix it would get used up. Octarine wrote: We’ve gotten enough gravy to fill a jacuzzi. I really enjoyed the Left field milk and will buy more in the future. 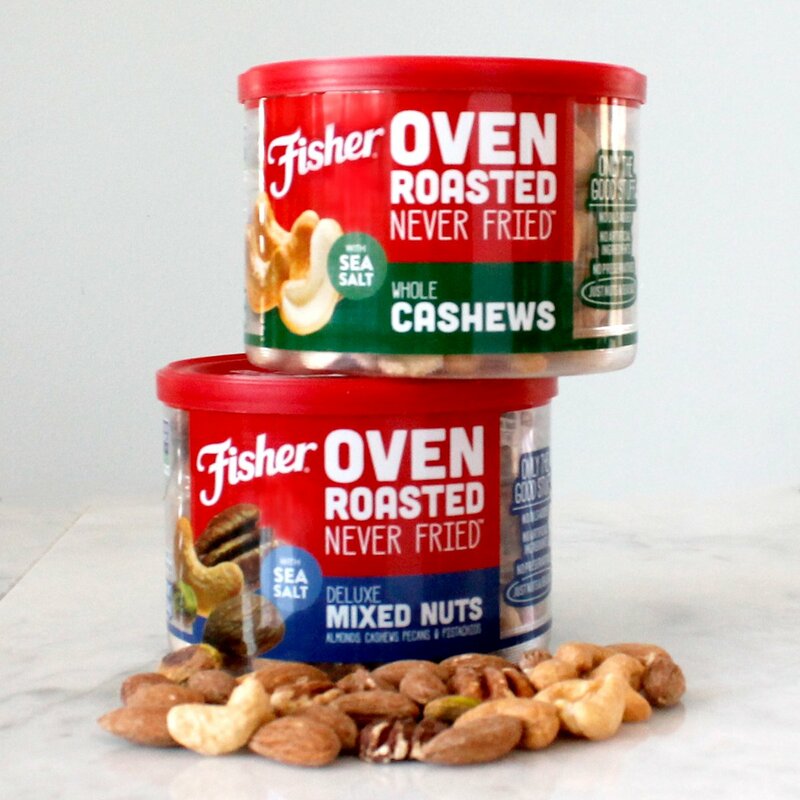 I just got back from the Chicago Avenue Jewel in Evanston, and they were out of the WOD, and so I asked at CS if there was something I could substitute, and he said I could substitute a can of peanuts or a can of Fisher almonds. I chose the peanuts. It is just as well anyway. I love cashews, and once I start eating them I can't quit. I redeemed a coupon for a free gravy mix. I hope I don't get any more. I was going to redeem a coupon for a free bagel, but all they had left was jalapeno, and they were out of donuts too.